The North Atlantic Treaty Organization is headquartered in a complex in Haren, part of the City of Brussels municipality of Belgium. The staff at the Headquarters is composed of national delegations of member countries and includes civilian and military liaison offices and officers or diplomatic missions and diplomats of partner countries, as well as the International Staff and International Military Staff (IMS) filled from serving members of the armed forces of member states. Non-governmental citizens' groups have also grown up in support of NATO, broadly under the banner of the Atlantic Council/Atlantic Treaty Association movement. A new €750 million headquarters building began construction in 2010, was completed in summer 2016, and was dedicated on 25 May 2017. The 250,000 square metres (2,700,000 sq ft) complex was designed by Jo Palma and home to a staff of 3800. Problems in the original building stemmed from its hurried construction in 1967, when NATO was forced to move its headquarters from Porte Dauphine in Paris, France following the French withdrawal. The cost of the new headquarters building escalated to about €1.1 billion or $1.23 billion. ^ Mayo, Virginia (13 November 2014). "NATO shows off its new HQ-to-be". Associated Press. Retrieved 11 December 2014. ^ "NATO's new headquarters". NATO. 23 May 2017. Retrieved 23 May 2017. ^ Collins 2011, p. 26. ^ Le Blévennec, François (25 October 2011). "The Big Move". NATO Review. Retrieved 19 December 2011. ^ NATO (February 2017). "New NATO HQ" (PDF). www.nato.int. Retrieved 26 May 2017. ^ Daniel Halper (25 May 2017). "New NATO Headquarters Cost $1.23 Billion". The Washington Free Beacon. Retrieved 26 May 2017. 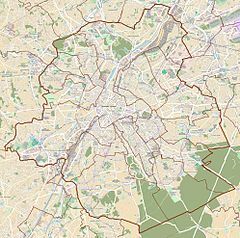 Wikimedia Commons has media related to NATO Headquarters, Brussels. This page was last edited on 15 January 2019, at 08:58 (UTC).